Adaptations for Students with Visual Impairment and Other Special Needs. Today's entry is mostly images I shot of my classroom on the way out the door this afternoon. The theme is adaptations for learners with visual impairment in addition to other special needs. I hope you enjoy them and maybe find a good idea among them. When we moved to our new building in September one of our visually impaired students had trouble locating parts of the room. 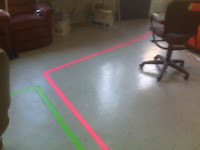 The orientation and mobility specialist recommended we mark the routes with tape. Then I found neon duct tape at Walmart. 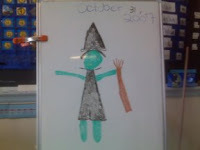 The green line goes to PT the pink into our other classroom where speech therapy and life skills group are held. 8x10 inch black on white Mayer-Johnson symbols held up with the correct color neon duct tape marks each spot. 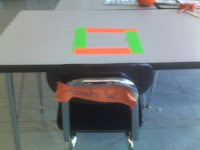 This particular student needed a way to mark his place at the table. Now he has a neon square in tape. It works well for him; he can see the tape a bit and can feel the tape as well. We have discovered that if we put a number of parts of a task inside the square he can locate them, complete the tasks and place them in a finished bin. This set up seems to be helping him with finding his plate on the table at meal times too. 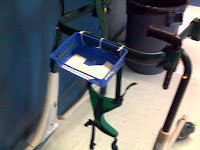 This image is of a gait trainer with a one dollar basket attached with plastic cable ties. The bask holds the student's "business cards". The cards have a message that go something like this, "My name is so&so, I love passing you on my walk everyday. I want to let you know that I am legally blind. I can see lights and pretty ladies! I also want to let you know it takes me about 30-45 seconds to answer questions. If you have time to wait for me to answer please say hello!" Our field trip to Les Miserables is tomorrow! Here is a photo of our Les Mis window. We have a terrible view (a brick wall and a dumpster, and if you look down a nasty roof top) so decorating the windows makes life a little nicer for us! We are so excited in my classroom. Thursday is our big trip to see Les Miserables. Today we finished the Stepping Stone Classics adapted version of the book. This is the first time I have used a Stepping Stone book and we loved it. The staff loved it, even our die hard, read Victor Hugo's original (I read it too), Les Miserable fan thought it was a nice adaptation. If you have students capable of understanding on about a second to fourth grade level these adaptations make great read-aloud books. 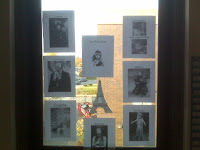 The students favorite part of the Les Miserables unit (until we actually see the play), I think, was not the book or the music but my multiple re-enactments of the musical using puppets made out of print outs of each character from Google Images and popsicle sticks. They really liked the chase scenes. I also imported the images into Boardmaker so that I could make many worksheets about the characters and the plot. Another great thing has been that the theatre where we are seeing the play (North Shore Music Theatre) has a blog with pictures of the set and cast. The pictures didn't go up until nearly the end of our unit, but we did print out the images and discuss them. Read more about my reasoning on the theatre and students with multiple disabilities here. Wowio books is an online resource that provided free PDF versions of current books to readers. You must register in a way that allows verification of who you are (i.e. a non-private e-mail, like a school or company email) and you must fill out demographic information. I was a little cautious of Wowio books at first because it hasn't really had great reviews, especially in the areas of privacy and because it is ad supported. However I discovered that some of the content included science books for children that could be used in an age appropriate manner with my high school special needs class so I gave it a whirl. I have not been disappointed. As for my privacy concerns all Wowio really has is my name and school e-mail address, so I am not too worried. The advertisements have also not been a problem. They are small, if they exist at all in the books I have downloaded and they have all been for public service announcements so far. The two things that have made using Wowio great so far are the more advanced accessibility features of Adobe PDF Reader 7 and the fact that Wowio has created the books in a way that allows copying and pasting content if needed to improve accessibility. Thus for some, not all, materials I can cut the text and paste into the "Symbolate" feature of Boardmaker 6 for my learners. Using the most current version of Adobe's PDF Reader it is possible to make PDF's somewhat accesible meaning you can make it so as reader can "turn pages" with a switch (in the PDF reader under view choose full screen, set the switch as enter, now the switch turns the pages), use a touch screen, access multiple features with mapped switches (switches assigned to act as various keystrokes), access multiple features with an off the shelf joystick and Joy-to-Key, and to make the PDF read allowed. The new PDF reader is also more accessible to screen readers and has a build in "Read Out Loud" feature (which can be a bit buggy and is located under view). I recommend giving Wowio a try and seeing if it can benefit your students. Read about PDFs and accessibility at Web Aim. Download "Reading Accessible PDF Documents a guide for Persons with Disabilities"
The Wong Pain Scale is a standard way for doctors, nurses and medical staff to have patients indicate levels of pain in order to determine the need for further treatment. In speaking adults patients are generally just asked to rate pain on a scale of 1-10, but for children, non-speaking individuals and those with cognitive disabilities either the Wong Pain Scale or, less frequently the alternate Faces Scale Revised is used. When I learned more about this system and how it is used, especially as it relates to my students I decided my students should have experience with the Wong Pain Scale, so that they are familiar with it and able to effectively use it in emergencies, at doctors visits and while in the hospital. I used the "right click - save image" as feature to save a version of the Wong Pain Scale (found via Google Image search) to my computer and then imported it into Boardmaker. Now I can search in Boardmaker for "Wong Pain Scale" and add it to the bottom of every medical board I make. I can also add it to curricular materials such as those I am currently making for a unit about communicating in an emergency. Students, even verbal students, can then be taught how to point to the correct part of the pain scale for how they are feeling. They can be taught to understand what it means when they see the pain scale (someone wants to know how much it hurts). 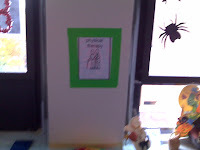 Learning activities can include talking about how much different kinds of things might hurt and which picture your would point to. For example, "Point to the part of the scale you would use for a bee sting. Now for an ear ache. Now for a broken leg." This kind of lesson gives our students the tools they need before they need them. The pain scale can even be imported into higher tech AAC devices and be intergrated into communication systems for daily communication about pain. At Closing the Gap Dynavox introduced a new dynamic display device for users who are not ready for the complexities of the V series. The device is called the M3 and is similar to the older style MightyMo/MiniMo as far as intended audience (functional/beginning communicators) and that it uses digitally recorded voices (i.e. you record the words and phrases), but that is where the similarities seem to end. The press release reads, "Designed for the Emergent Communicator. Symbols with concrete representations and new InterAACT® visual scenes reduce the cognitive load placed on the user, making it the choice for emergent level communicators. The preprogrammed pages provide a means to begin developing literacy skills based on core words and phrases organized in distinctcategories, helping emergent communicators interact in a range of classroom, home and social settings." The M3 has the same physical specs as the Dynavox V. It runs on Windows Ce (like the Dynavox Series Four devices), you can import digital photos and other images as symbols, it can be programmed to act as an environmental controller, it is compatible with the PhoneIt program, and it has an ability to connect via wired ethernet to download upgrades. One cool thing is a new feature called touchzoom and scanzoom that blows up the symbols being activated or scanned to aide those with visual impairments or trouble focusing. Visit the Dynavox M3 Website for more info. This site is just as much for sharing with the OT, PT and SLP on your team as it is for you. MedTrade has posted a variety of articles, most focusing on rehabilitation, but many on new assistive technology products. A good place to learn about what is available out there for our students. "I am commenting on the article located at (removed because of positive reply from the site). The article at the site says, "I learned that Queenie Archer has cerebral palsy, a degenerative muscular disease, as well as dysarthria, which prevents her from speaking clearly." Cerebral palsy is NOT a degenerative muscular disease. See the information from United Cerebral Palsy below. The errors in your article, high lighted on your websight are an insult to Queenie and perpetuate a negative, erroneous stereotype about cerebral palsy. You should correct the article and apologize. "Cerebral palsy, also referred to as CP, is a term used to describe a group of chronic conditions affecting body movement and muscle coordination. It is caused by damage to one or more specific areas of the brain, usually occurring during fetal development; before, during, or shortly after birth; or during infancy. Thus, these disorders are not caused by problems in the muscles or nerves. Instead, faulty development or damage to motor areas in the brain disrupt the brain's ability to adequately control movement and posture. "Cerebral" refers to the brain and "palsy" to muscle weakness/poor control. Cerebral palsy itself is not progressive (i.e. brain damage does not get worse); however, secondary conditions, such as muscle spasticity, can develop which may get better over time, get worse, or remain the same. Cerebral palsy is not communicable. It is not a disease and should not be referred to as such.Although cerebral palsy is not "curable" in the accepted sense,training and therapy can help improve function." "Kate, Thank you for your comments. I also thank you for bringing this article to my attention. Unfortunately, I started working here less than a year ago and was not made aware of the inaccuracies included in this article that was printed in 2005 until your email this weekend. I will forward your comments to the department director for further follow-up. Thank you for your time and dedication to ensuring that stereotypes are not tolerated. I myself do not condone such behavior and will do my best to ensure that it doesn’t happen in the future under my watch." I have begun posting all of my none Boardmaker curriculum files (including Power Point files) in a Google Group called Kate's Curriculum. Down load anything you might need. Credit it me if you use it beyond the classroom, please. I would like to thank Jim for making tonights post easy for me. He asked I share which listservs I subscribe to so here goes. QIAT - The QIAT Consortium is a nationwide grassroots group that includes hundreds of individuals who provide input into the ongoing process of identifying, disseminating, and implementing a set of widely-applicable Quality Indicators for Assistive Technology Services in School Settings. This is a high action group - expect a high volume of e-mails. I do not recommend the digest however because it is hard to navigate. I prefer having a separate e-mail account to all of my listserv (and sped catalog related e-mails go to). Disability Policy Alliance - (Sign up through the ARC or UCP.) The DPA sends out periodic action alerts, based on your USA zip code, which let you know about important policy issues facing your local, state and federal legislators. The action alerts include a newsletter (Action Insider) which have great summaries of the issues at hand and links to help you take action on whatever level you are most comfortable. MSN Adaptive and Assisitive Technology I actually only read the digests of this one, things are posted very, very infrequently, but their is the occasional gem. Council for Exceptional Children - I am on various CEC lists. Membership costs (really costs), but is worth it. If you wouldn't mind terribly, could you vote for TLWMSN? This blog has been nominated for some blog awards. There are NO other special education blogs nominated in the education categories of either contest. Homeschooling blogs, yes. Even a birdseed education blog. But not one other special needs blog. and The 2007 Weblog Awards (about 15 nominations down) are where to go to vote. I don't care if TLWMSN wins or not, but it would be nice if a special needs blog made a good showing. Note: you might need a few minutes to vote, you must register to avoid voting fraud. Infogrip is looking to upgrade old Kidstrac, Kidsball and Easyball trackballs to the new BIGtrack for $45. Check it out. JR Cooper announced his new adapted iPod remote today in all of the assistive technology listservs I am on. The remote is has five buttons. It is a RF (radio frequency) remote. so you do not need to aim it at the iPod. It is angled slightly towards the user. Mr. Cooper states that a scanning version should be out in several months. This remote should be very useful for some students. He incorrectly points out that his is the only adapted remote on the market for new iPods. He states that the iScan MP3 (distributed by Enabling Devices in the USA and Canada) does not work with new iPods, but it does, however it needs a tiny adaptor and the auditory scan feature (you can still see the scan) does not work. Thus his is the only large button remote on the market and the iScan MP3 is the only scanning remote on the market as of now. A side note: you do not need in any way to buy JR Coopers AAC remote for iPod. First of all he calls it the Labtec Pure-Fi, most likely a typo, but it is a Logitech Pure-Fi (no such thing as a Labtec and if you enlarge his picture you see it is a Logitech). Secondly he does nothing to adapt it and it still is the highest priced Logitech Pure-Fi on the web. You can find them as low as $125. Thus you should do your home work. Absolutely any IR (infrared) iPod remote will work to program your AAC devices if it accepts IR commands. Just Google "IR remote iPod". My favorite one costs about ten dollars, but you will need to use your ear buds, no speaker attached with the ten dollar one. You can also go to your local electronic store for one (with or with out speakers). A smooth talker may be able to get Best Buy or Circuit City to donate one. A German Company, INCAP, is selling a new dynamic display AAC device, the Momobil in the European Union and abroad. The INCAP website describes it as follows, "MOMObil is a modern and powerful communication aid with voice output. The compact and mobile communications device is very versatile and can flexibly be adapted to individual needs. The control can take place in very different ways: by hand, via keyboard or via the integrated touch-screen, or via a head control, if only the head can be moved. Even with only very small motional possibilities an operation via switch (e.g. pushbutton) is also possible. In case of extreme handicaps an EMG or brain wave control is applicable. The MOMObil has a dynamic 10,4"-display. Thereby, it is almost possible to depict on screen as many signs or symbols as desired as well as many levels as desired. The number and size of fields is adjustable, programming is very simple. The MOMObil has a word and a letter prediction. In addition an environmental control function is built in. Technical Data: Dimensions: 290 x 220 x 41 mm, Weight: 1400 g, Display Size: 10,4", Runtime Battery (1 Battery): approx. 3 hrs., Housing: very robust, water proof, WLAN integrated." It is being sold by INCAP and Special Needs Computing. As always I welcome comments and e-mails from the designers, vendors, users and their teams. This updates the June 28, 2007 list. Several entries have been removed because the links are now broken, others have been added. You can find out more about Boardmaker at Mayer-Johnson. In the tradition of all of the wonderful special needs sites out of the UK (Priory Woods, Meldreth Manor, SEN Teacher, Curriculum Online, One Switch, Symbol World) today's site of the day, The Big Tree. "The Big Tree is a way in to the internet about important things for people with a learning disability. It is like a very big library or place to find information. You can also find other people who are interested in the same things as you. The aim is to make it easy for people with a learning disability to use. We have called it The Big Tree because it's going to grow like a tree. The branches are the groups of subjects that join the whole thing up. We call this 'the web'. The twigs of the tree are the pathways which you can't see but link the websites together. The leaves will be the websites about learning disability. The trunk of the tree will be where people can add their ideas. We call this 'community'. Finally the roots will be the system which makes sure it all works. We call this 'research'. To start with it will be small but each week new information will be available with links to many other internet websites. We hope its useful and you enjoy it." The site includes sections for the web (links), community (chat, gallery, news) and research (articles, a best practice series). The size is 2.5" x 5.25" x 1.04" which is the size is the size of this handheld game, only the Lingo is .25" shorter. It weights about 4.5 oz. It will be selling for $179.00 come "the winter 07/08 season". This reminds me of the four button wrist band AAC device that Ablenet sold about five or six years ago. (What was that called?) In theory it was a nice device, small, portable. However the first run out of the factory was impossible to program (I thought) and no sooner did Ablenet get them so they worked did they pull them off the market. I hope this is a nice alternate. I am waiting to hear reports about ease of programming, durability and volume. Ask yourself, "are they doing this in the other ninth (or second, or fifth, or seventh, or twelfth) grade rooms?" do we HAVE to do it this way for medical reasons? A yes answer might be the student with the pillow in her lap to position her hands to prevent edema. do we HAVE to do it this way because it is an accommodation to help us meet our age appropriate goals? (I'm making the assumption that the goals are age appropriate.) A yes answer might be that we are reading the shorter, illustrated book because it is an adaption of Les Miserable that makes Les Miserable accessible to our class. If not it is time to change what you are doing! Age out the other characters as kids grow. Sorry but Dora is out the door at age eight or nine. Arthur and Buster at the same time. Mrs. Frizzle and her magic school bus too. Baby Beluga is for babies. Give Raffi and his friends the heave-ho. Folk music is a nice replacement, trust me lots of aging hippies listen to it so it is age appropriate and it still has that sing-song kind of tone. Better yet bring on the Pink and the Bob Marley. Baby toys are out the door. Give them to charity, drop them off at Early Intervention. Save the baby toys for the babies. Better find another alternative to those bright plastic keys (real keys? real key chains? no keys?). Recover those puzzles with age appropriate pictures and laminate. Contact paper over those age inappropriate illustrations on some items. Phase out the Power Rangers and replace them with real heroes like fire fighters and police officers to learn about. Replace educational posters with images of young children with something else. The kids in the posters should be the age of your students. Donate the baby books to the library. If you students need sturdy books there are many ways to adapt age appropriate books instead of buying board books. Step Two - Positions please! I am sorry, but after about kindergarten children do not spend time at school horizontal on the floor, whether or not you have a mat. Buy a mat table. Get a mat table. Get the Elks, the Knights of Columbus, Home Depot, Johnny's grandpa, someone build one. Crawling stops at pre-school. Unless there is a medical/physical therapy related reason for a student to continue crawling, then it is time to stop. I have never, ever seen a physically challenged student who does not have a cognitive issue crawl at school. No way, no how. That would be embarrassing. So why do we let our kids do it? Stand them up in their walkers or gait trainers, put them in their wheelchairs. If they are not independent in those mobility devices then it is time to find one they can be independent in. Crawling is not a functional means of travel outside the home. Sink the stroller. Do I really need to explain this one? After you are four you need a wheelchair. No baby talk. Enough said. Program devices with matching age (and gender) voices and age appropriate vocabulary. No 16 year old girl's Dynavox should have the word pocketbook instead of purse! Sorry if this sounds ranty. I have had a massive number of encounters of the age inappropriate kind lately. At work, in the mall, visiting other schools, I am incredulous at some of what I see out there. With my own personal collection of Boardmaker Boards hogging all of the file space on the TLWMSN Google Group I started a Boardmaker Google Group. And then I filled all the memory with about 184 boards or zipped packs of boards, so I started a Boardmaker II. We can always shoot for a III and a IV if we fill up more. Add you boards! Or download all of mine. My new Australian friend from the Assistive Tech and TLWMSN social networks on Ning has created a page called Clikerpedia. Clickerpedia is a great resources for all things Clicker 5. It includes downloads of activities and templates, tutorials and multi-media references, links to free resources and quick tips. This long weekend I will be checking all of the links down the left of the site. The first five sections have been checked. Several links have already been removed because they did not work. I am looking for sites to add. Please comment or e-mail if you have ideas. What do you do when your high school aged power chair users drive unsafely? I give traffic tickets. I started doing this last year after multiple problems with several students who knew how to drive safely, but did not. They were jacking up their speed, driving on the left in packed hallways, not wearing their distance vision glasses, not following staff instructions to stop or watch out, and, on occasion, crashing for fun. Thus I instituted traffic tickets. The kids knew what they were, of course. All could indicate many people they knew who had been stopped by the police for speeding and other violations. That included their teacher, who explained, in detail, how scary it is to be stopped and how you can end up losing you license. Parents were brought on board and all agreed that the students needed to learn the importance of safe driving and the consequences of violating roles. 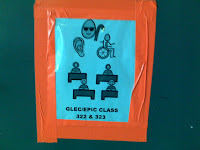 The students were told in no uncertain terms that three tickets mean you lose your power chair for the day. Several students received one or two tickets, but it took months for a third ticket to be issued. That student has never received another ticket. Normally I am a positive behavior support all the way kind of person and I don't want you to think my students don't have the supports to drive properly. They have had tons of direct instruction, they have visual and other types of cues and reminders as to the rules and how to best follow them, they are given all sorts of positive reinforcement for doing well. However, in this safety related situation I do use a more draconian last resport. You can get the Boardmaker file of my traffic ticket at the TLWMSN group. This is from a handout I created to give to my paraprofessionals during our fifteen minute daily meeting this morning. I thought it might be useful to others. Student two: Oh my gosh, he's gonna pop! Teacher: You drew the word surprised. Show me a surprised face. Student: (Pantomimes entering a room and turning on a light - like a surprise party.) Surprise! What the hell?! Teacher: (At the end of a thirty minute lesson on the dangers of drugs) What do you say to drugs? Student: I did it! I did it! Student: I did my fart in the bathroom like you said! Student: I said a polite word in the community. Student: We don't touch girls in community right? Teacher: That's right we don't touch girls in the community. Another customer at the store: Laughing. Men are really all the same aren't they? Student: (Age 19, in wheelchair, parked near toaster oven during cooking group.) Holy cow, it's like I am having hot flashes over here! Teacher: What kind of music will there be? Teacher: The DJ will play Bon Jovi? Student: (Gives teacher that you're-so-dumb look.) Jon's coming. Background: The year this happened we had a paraprofessional who was a little off her rocker, she was happy to admit this. Teacher: Who is crazier, me or the speech therapist? Point to who is crazier. Many of us incorporate a joke of the day into our Circle Time or Morning Meeting. Here are some school-appropriate sites to get jokes to program into Big Macks, Step-by-Steps or higher tech AAC devices. Last year I taught a year long unit on America History in which we studied a decade a month. A colleague asked for a copy of my teacher made materials. They are now available in .zip format at Woofiles. Over on the TLWMSN Google Group I just uploaded about 20 Boardmaker files for everyone. Enjoy! The Google Group is a great place for file sharing but hasn't been a place for special needs teachers to talk, now I am introducing the TLWMSN Ning Social Network Site I figured ("figured" is my classrooms word for the week) it was worth a shot to make a social network for us. In case you are new to the concept of social networking (that's what things like Friendster, Myspace and Facebook are) you can read or view a simple explanation. You can also read specifically about Ning. Ning networks are like contained versions of Friendster or Myspace. They focus on one topic, such as Ninjas, Firefighters or Assistive Technology. Now there is a Ning network for us, special needs teachers who focus on learners with multiple disabilities (or whatever other phrase you use). It is a place to tell success stories and ask question. A place to meet others in the field from all over the world. Check it out!